Grapefruit Seed Extract (GSE) is a substance that is derived from the seeds, membranes, and the pulp of grapefruit. On its own, it is extremely acidic and bitter in taste. GSE products usually come in the form of a liquid with glycerin added to make it less acidic and bitter, or in the form of capsules or tablets. Is grapefruit seed extract safe for dogs? GSE is rich in vitamins C and E, and is a broad-spectrum (multi-purpose), non-toxic, antimicrobial substance. It has powerful antibacterial, antiviral, anti-parasitic, antifungal, and antioxidant properties. Grapefruit seed extract also detoxifies the body and supports the immune system. 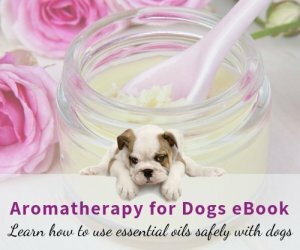 GSE can be used safely on dogs both topically and orally. Furthermore, it can be used as a natural cleaning agent and preservative because of its antiseptic power. But how does GSE work? Simply put, GSE works by destroying the cell membrane of microorganisms such as bacteria and fungi, inactivating them and making them unable to replicate and survive in the body. In addition, although highly acidic in taste, GSE is in fact helpful in alkalizing the blood. Since microorganisms such as bacteria and fungi cannot live in an alkaline environment, GSE renders the body an undesirable place for such microorganisms to proliferate. One amazing thing about GSE is that, although it acts like an antibiotic, it is different from antibiotics. Antibiotics kill off bacteria indiscriminately in the body (i.e. antibiotics kill off the bad as well as the good bacteria, thus leaving the body vulnerable to yeast overgrowth). On the other hand, GSE does not kill off the good bacteria; therefore the body can still have a healthy gut micro flora despite GSE use since GSE only destroys the bad bacteria. Moreover, unlike antibiotics, which can lose their efficacy on certain pathogenic microorganisms due to a resistance built up by the microorganisms, to date we cannot find any report on microorganisms that have been able to build up a resistance against GSE. Additionally, GSE does not contain chemicals and is non-toxic. Over-dosing is unheard of. In fact, according to a laboratory test, it would take at least 4,000 times the normal dose of GSE to produce a 50% chance of poisoning. GSE can be diluted and used to treat bacterial and fungal infections of the skin and the ears that so often happen in our dogs. It can also be used on other dog skin problems such as skin rashes, mange, and to repel fleas. Ear Infections: Mix 4-10 drops of GSE with ½ oz of 100% pure aloe vera juice or witch hazel. Use it to clean the ears 2-3 times a day. Skin Bacterial/Fungal Infections: Mix 10 drops of GSE per tablespoon of shampoo. Use it to wash the dog, let the shampoo stay on the dog for 5-10 minutes before rinsing it off. Make sure that the shampoo does not get near or into the eyes! You can also make a spray. Mix 30-40 drops of GSE with one liter of water in a spray bottle, and spray affected areas 2-3 times a day. Again, avoid the eyes! 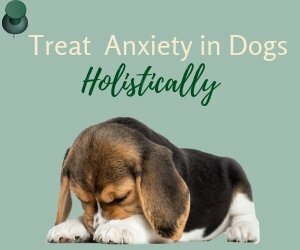 Itchy, Yeasty Paws: If your dog has “yeasty” paws, make a foot soak using GSE – In a bucket or similar container, mix 30-40 drops of GSE with one liter of water. Soak your dog’s feet a few times a day. Minor Cuts & Wounds: Use 1-5 drops of GSE in 2.5 ml of water. Apply the solution to the wound frequently (3-4 times/day) to promote healing. Yeast Infections: For Candida yeast infections, try putting 3 drops of GSE in your dog’s food twice daily. Putting the GSE in the food is the easiest way to give it to your dog. Most dogs do not mind it in their food. Upset Stomach: If your dog suffers from tummy upset (e.g. diarrhea, gas) due to bacterial or viral infections, put one drop of GSE per 10 pounds (5 kg) of body weight in the food, 2-3 times a day. For acute infections, the dosage can exceed the above amount. 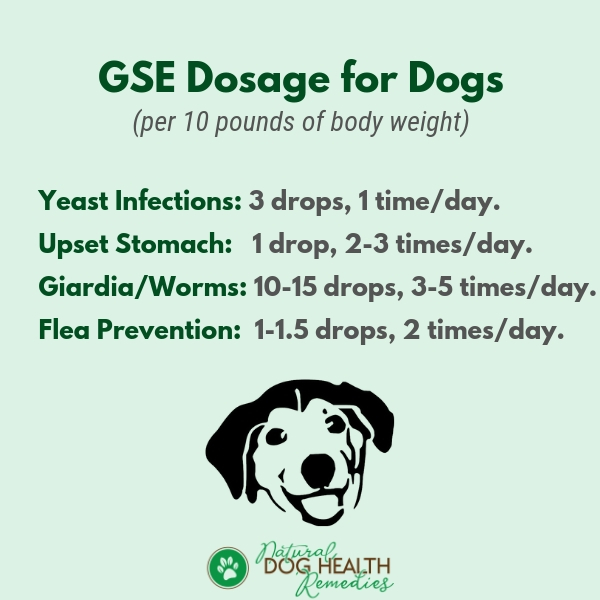 Parasites: For parasites such as giardia or minor intestinal worm infestations, use 10-15 drops of GSE per 10 pounds of body weight, up to 3-5 times a day. Flea and Infection Prevention: You can also add GSE to your dog’s food to prevent infections and repel fleas. In such cases, as a general guideline, the dosage is 1-1.5 drops per 10 pounds (5 kg) of body weight, twice daily. Last but not least, you can use GSE as a natural non-toxic antiseptic agent. If you are feeding raw foods to your dog, add a few drops of GSE to the foods to prevent food poisoning since GSE can kill off pathogens in the foods. You can also use GSE to clean kitchen utensils and counter. For example, add 15 to 20 drops of GSE directly onto your cutting board, scrub the drops in a bit, and leave it for a half hour and then rinse thoroughly and allow it to dry. Add 15 to 30 drops to a 32 oz. spray bottle and use it to spray your kitchen counter, fridge surface, and your dog’s sleeping area. When washing your dog’s food and water bowls, add a few drops of GSE to kill off bacteria. When washing your dog’s bedding, blankets, etc., add 20 drops to the last rinse. Generally speaking, GSE is very safe and, as mentioned above, over-dosing is unheard of. However, DO NOT use full strength - always dilute GSE before using. DO NOT use it on the eyes, membranes, or sensitive areas. GSE rarely produces any kind of allergic reaction in people and pets, even when taken regularly. 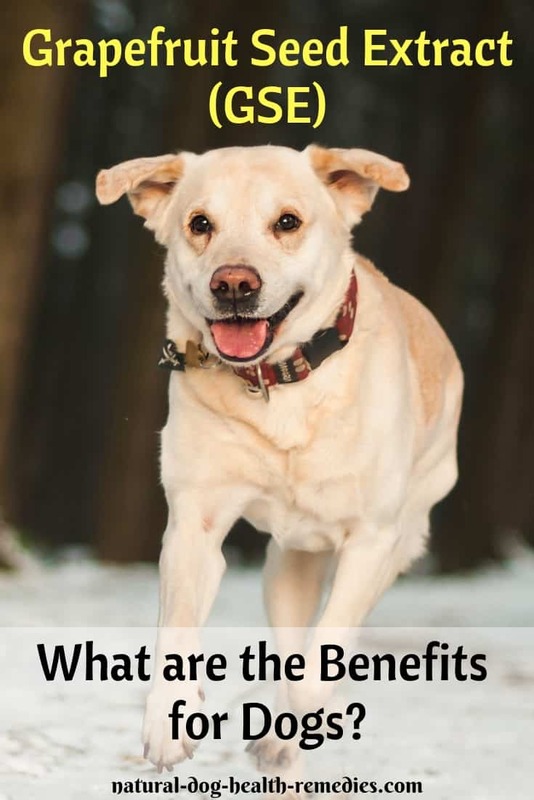 But if your dog has stomach ulcers, or if the stomach or intestinal lining is already sensitive, irritated, and/or ulcerated, GSE may cause problems due to its high acidity. In this case, reduce the amount and be sure that GSE is given with food. GSE can be safely combined with many herbs without creating any adverse interactions. 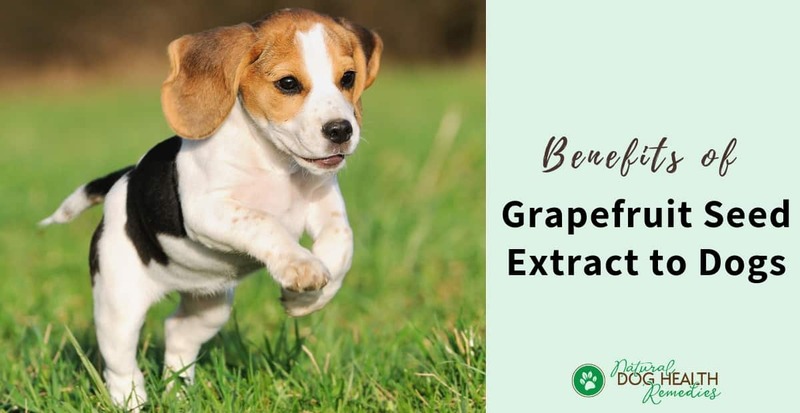 If your dog is taking medications, it is advisable to check with your vet before giving GSE to your dog because grapefruit (the fruit itself, grapefruit juice, seed extract) is known to either diminish the potency of certain drugs, or increase their toxicity. 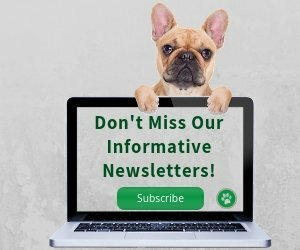 Get more natural remedies for dog ear infections from this page.